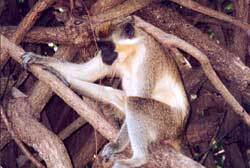 The area of Kiang West National Park (KWNP) is approximately 11,500 ha (115 square km) and one of the most important reservoirs of wildlife in The Gambia. KWNP is situated in Lower River Division in the Kiang West District, 145km from Banjul. It was established as a national park in 1987. Although the major part of the National Park is dry deciduous woodland and guinea savannah, there are extensive stretches of mangrove creeks and tidal flats. In the mangrove creeks, the West African Manatee and the Nile Crocodile occur. In the Mangrove fringes and tidal flats the tracks of various animals such as the African Clawless Otter, Marsh Mongoose and Sitatunga are to be found. Kiang West National Park has become a park of regional distinction possessing an impressive range of fauna and avifauna (over 250 bird species checklisted to date) as well as a number of distinct biotopes. Kiang West National Park is bounded to the north by the River Gambia and is dissected into three areas by the Jarin, Jali and Nganingkoi Bolons. Tubabkollon Point in the extreme north east of the park offers good access to the river and is a convenient location from which to explore the escarpment to the west. This laterite escarpment runs close to the river bank and marks the extent of the river during past pluvial periods. Good viewing conditions are to be had from this high ground, with opportunities to observe Warthogs, Bushbucks and occasionally Sitatunga which forage along the grassland fringing the saltpan below. A viewing shelter has been erected at TubabKollon Point and overlooking a waterhole about 2km to the west. This attracts a wide diversity of animals as the dry season progresses. Troops of Guinea Baboons and Western Red Colobus Monkeys also move from the dry woodland into the mangrove for roosting late in the evening. The upper reaches of the Nganingkoi Bolon on the eastern edge of the park provide rich feeding for a variety of waders and the opportunity to see marsh mongoose as they pursue crabs and other invertebrates along the mangrove fringe, at this point delineated by a belt of Acacia Seyal . This area is where most sightings of Roan Antelope have been made in recent years. Humpbacked Dolphins are occasionally seen on the Jarin Bolon, and a patient observer at the junction of the bolons may be rewarded with a sighting of a manatee or sitatunga crossing the bolon to Jali Island. The natural vegetation in most of The Gambia is Savannah of a type called Guinea Savannah or Guinea Woodland Savannah. It can best be described as an open woodland consisting of low deciduous trees and tall grasses up to 3 m (9ft) high. In the coastal area this Savannah woodland tends to be more dense and to consist of higher trees. As the dry season progresses, the tall grasses die back and combined with the dry leaves of the trees provide ideal conditions for fire. These fires are sometimes accidental but in the great majority of cases the grass is deliberately burnt to clear the land for agriculture which too often spread out of control. Many raptors, bee eaters, rollers and swallows are often attracted to the fires where they help themselves to insects and other small animals trying to escape the flames. In the rainy season, movement in the Savannah is quite difficult due to the dense growth of the high grass, but as the grass dies back the countryside becomes more open and easier to traverse. The Savannah is also affected by the grazing of an increasing numbers of domestic cattle and goats, which combined with the incidence of fire prevents the natural regeneration of trees and shrubs. There are numerous programmes currently in operation within The Gambia to develop more sustainable land use practices. All the major wild mammals known to be permanently resident in the Gambia at the present time have been recorded in Kiang West National Park, making it the foremost wildlife reserve in the country. The park offers a significant national refuge for species such as Caracal, Serval, Bushbuck and Common Duiker which are all fairly widespread in The Gambia but in low density. Roan Antelope are not currently resident in the area though small groups visit the park from the Cassamance area of Senegal during the end of the rainy season. As their home range is typically 80-1000 square km, the park is probably inadequate to support this species year round. Warthogs are abundant in the park and surrounding woodlands. Spotted hyena are common, their tracks are found regularly throughout the area but they are shy and rarely seen during daytime. There have been occasional sightings of leopards in the area, though being shy and elusive they are unlikely to be encountered. Reptiles that occur include the Nile Crocodile and the African Rock Python, Bell’s Rock Python, Nile Monitor, African Beauty Snake, Spitting Cobra and Puffadder. Chelonians are represented by the hinge-backed tortoise, an interesting species, found in the savannah woodlands and the hinged or mud terrapin which occur in the bolons (tributaries or creeks). Oysters from the roots of the mangroves are a delicacy for both local residents and visitors. A survey carried out in July 1990 identified a total of 158 species from 48 different families occurring within the park. This number when combined with 3 years of dry season observations has resulted in a total bird count for the park of more than 250 species, almost half of the total country record. The park area contains 12 species with a very local distribution and which are difficult to observe elsewhere in The Gambia. The brown-necked parrot present in the mangrove forests of the park where it breeds is an IUCN threatened species. 21 raptor species including vultures, harrier eagles, hawks and falcons have been observed within the park boundaries. This number increases during the dry season when migratory birds of prey visit the country. The presence of this great diversity of raptor species is the most important ornithological factor to have resulted from this survey. Two eagle species, the martial eagle and the bataleur are the West African avian equivalents of some of East Africa’s big game species. The bataleur is more regularly and reliably seen, and is the official symbol of Kiang West National Park. All ten species of kingfisher found in The Gambia occur within the park boundaries.